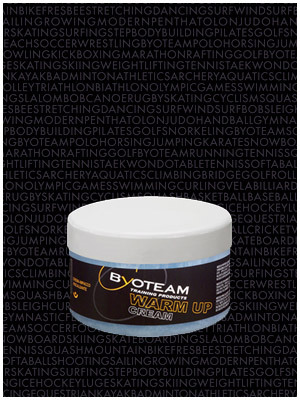 Indicated for heating and toning muscles. When applied to the skin, it is delicately absorbed without causing irritation, providing a pleasant feeling of warmth. Particularly indicated for stimulating massage before sports activities. Apply a sufficient quantity of cream to the area to be treated and massage briskly. Menthol, Camphor, Capsicum frutescens, DFC (Vitamin A, Vitamin E, Olive oil, Almond oil, Jojoba oil, Iron, Copper, Zinc, Magnesium).